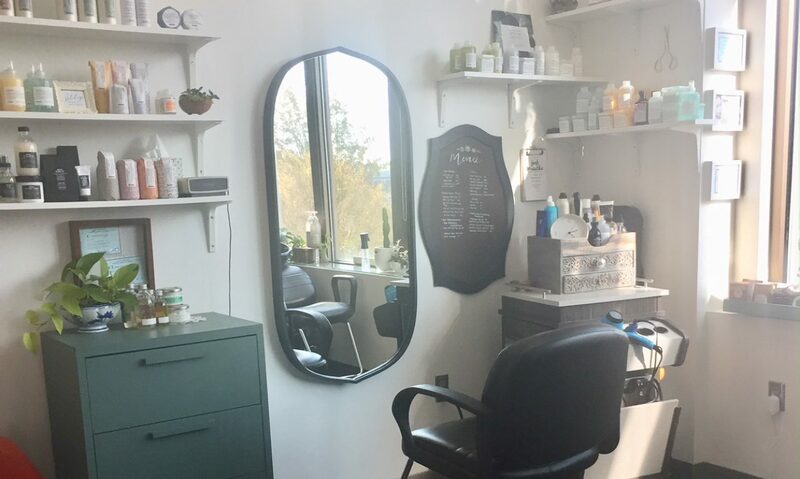 PERSIMMON SALON – The mission at Persimmon Salon is to provide self-care esthetic solutions by using products that are sustainable, effective and gentle while maintaining an atmosphere that promotes calm and well-being. The mission at Persimmon Salon is to provide self-care esthetic solutions by using products that are sustainable, effective and gentle while maintaining an atmosphere that promotes calm and well-being. * A consultation is required prior to booking the DevaCut to analyze your hair and discuss expectations. This investment in your hair starts at $85. The amount may change based on your hair and the time it will take to complete the service satisfactorily* For your convenience consultations can be done via Skype or FaceTime. Schedule the consultation online today! What exactly is the Deva Cut? The Deva cutting technique is a revolutionary method for cutting curly hair whereas most traditional hair cutting techniques were created for straight hair. The advantage of Deva Cuts is that it’s customized to work with your unique curl pattern. This curl exclusive cut requires special training to learn the technique. The hair is cut dry, simply because we wear our hair dry not wet. Curly hair and its spring factor (or shrinkage) can be misinterpreted while wet- that’s why the hair is cut in its natural form, while dry, curl by curl. This unique innovation allows the stylist to sculpt each client’s hair, according to their individual curl, look, and style because no two curls are alike. Buildup Buster™ a powerful cleanser using micellar technology to gently remove buildup from the hair and scalp without stripping. Deep Sea Repair for strength & definition. Transformation service – see your curls like never before! Consultations via Photos, FaceTime and Skype! To save gas and time, I’m now offering consultations via photos, facetime and skype for all services. Click the book now button below and schedule a time slot for facetime or skype consultations. If your prefer to send photos, include a description of the service you’re interested in with your text. When sending photos, make sure your hair is down and not stretched if it’s naturally wavy or curly. I will send the phone number for skype and facetime at the time of request! Expect a slight price increase on March 1, 2019. All services scheduled before 3/1 will reflect the old service menu prices….So book now! Stay tuned for other promos! Thanks for your support and understanding! Persimmon Salon will be offering monthly membership packages! The first is a package for natural/textured haired clients who enjoy an occasional blowout or looser curls. This package includes two natural blowouts, one moisture treatment and champagne/or mimosa during each visit for $110 a savings of $25 if purchased a la carte. The service begins with a relaxing scalp massage, followed by an invigorating shampoo and conditioner. The hair is then blow dried and styled with body and shine with results lasting from 1-2 weeks! The fine print: The package price is subject to change or be discontinued. Packages must be purchased on the first day of each month and must be used in it’s entirety during a month’s time. Book both appointments at the same time. Adjustments in price will be made by the stylist. Services not used can not be applied to the following month or transferred. Please allow 24 hours to reschedule. Cannot be combined with any other discount or offer. Schedule your Textured Hair Blowout service today! Not quite ready for a haircut but could use a clean up? This is in and out service is perfect! Address the hair around the ears and neckline with this quick service! What is interlocking and why I choose that method? Interlocking strengthens the lock at the base or root. Locs “gain weight” and get heavier as they get longer. As they grow in length and increase in size the base of each loc should support the new weight of your hair. A small square, circular or triangular section of hair is crocheted into what looks like a round braid. Hair is locked counter-clockwise to maintain roundness and produce a look that is more consistent in size and shape throughout. Maintenance is recommended every 6-8 weeks, you can wash your hair by yourself without fear of locs coming undone. Interlocking allows you to shampoo the hair on a regular basis without the concern of excessive frizzing and the need to re-twist. Additionally, all air pockets are removed from the loc during the interlocking process creating a smoother loc, free from lumps that can sometimes form during the twisting process when hair starts to bud.